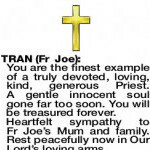 The most wonderful Priest to walk on this earth, loved dearly by all. Goodbye Father. Rest in Peace. 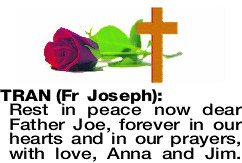 Rest in peace now dear Father Joe, forever in our hearts and in our prayers, with love, Anna and Jim. 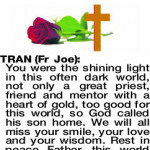 You were the shining light in this often dark world, not only a great priest, friend and mentor with a heart of gold, too good for this world, so God called his son home. We will all miss your smile, your love and your wisdom. 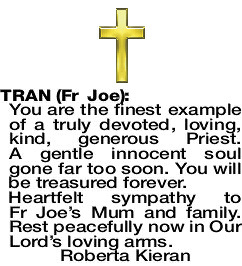 Rest in peace Father, this world mourns your loss. Blessed Mother Mary pray for us. Peter, Michelle, Roma, and Bert Hiscock. 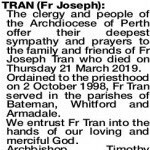 TRAN FR JOSEPH The clergy and people of the Archdiocese of Perth offer their deepest sympathy and prayers to the family and friends of Fr Joseph Tran who died on Thursday 21 March 2019. 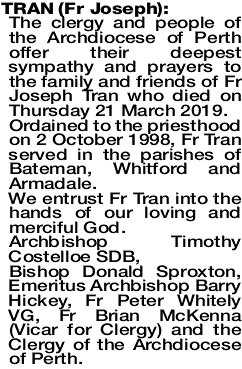 Ordained to the priesthood on 2 October 1998, Fr Tran served in the parishes of Bateman, Whitford and Armadale. 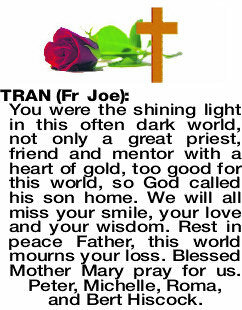 We entrust Fr Tran into the hands of our loving and merciful God. Bishop Donald Sproxton, Emeritus Archbishop Barry Hickey, Fr Peter Whitely VG, Fr Brian McKenna (Vicar for Clergy) and the Clergy of the Archdiocese of Perth. 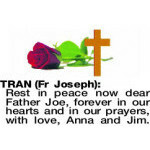 TRAN FATHER JOSEPH Our hearts go out to all the family on the loss of your son and brother. You are the finest example of a truly devoted, loving, kind, generous Priest. A gentle innocent soul gone far too soon. You will be treasured forever. 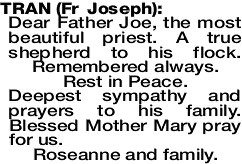 Heartfelt sympathy to Fr Joe's Mum and family. Rest peacefully now in Our Lord's loving arms. 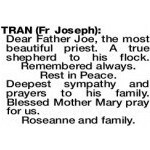 Dear Father Joe, the most beautiful priest. A true shepherd to his flock. Remembered always. Rest in Peace. 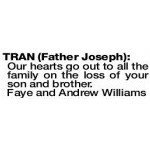 Deepest sympathy and prayers to his family. Blessed Mother Mary pray for us. 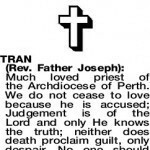 Much loved priest of the Archdiocese of Perth. 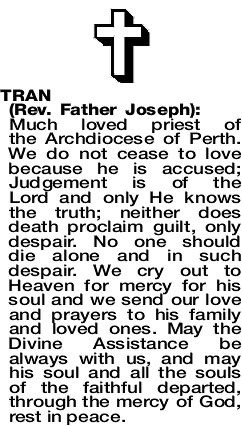 We do not cease to love because he is accused; Judgement is of the Lord and only He knows the truth; neither does death proclaim guilt, only despair. No one should die alone and in such despair. We cry out to Heaven for mercy for his soul and we send our love and prayers to his family and loved ones. May the Divine Assistance be always with us, and may his soul and all the souls of the faithful departed, through the mercy of God, rest in peace. Farewell to a beloved brother in ministry. 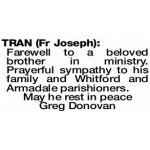 Prayerful sympathy to his family and Whitford and Armadale parishioners.